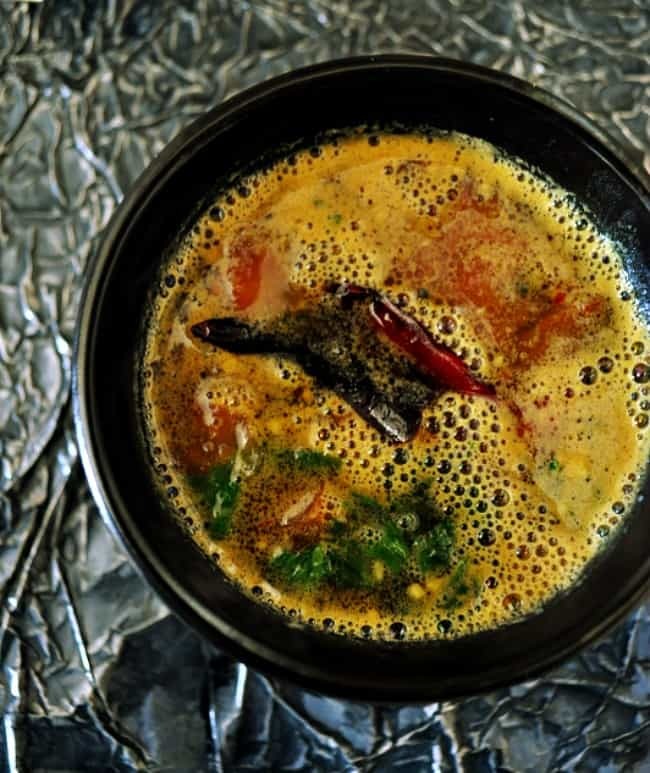 Mysore Rasam Recipe with step by step Photos and video. 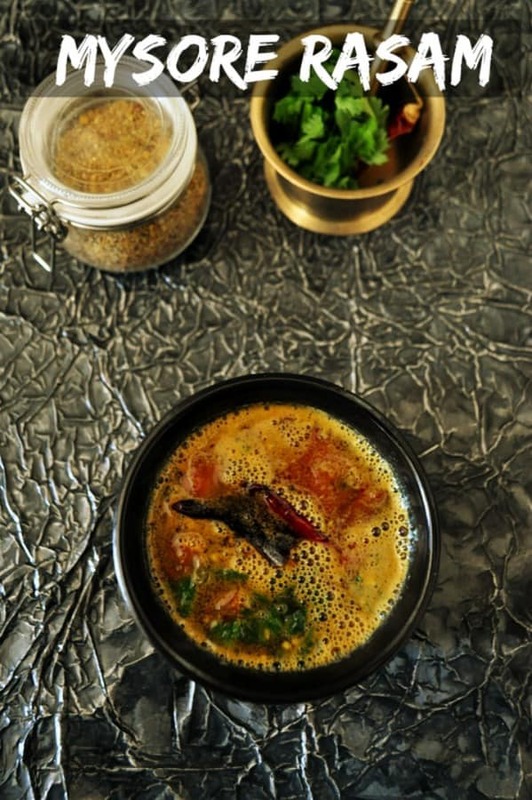 Mysore Rasam is made of Freshly ground Mysore rasam powder with coconut and dal. 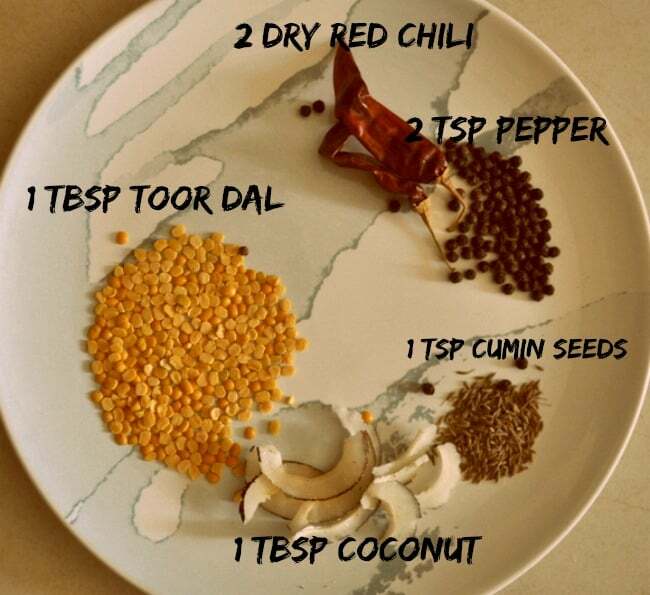 Mysore Rasam Powder Recipe with coconut and exact measurement of Ingredients are shared here. Mor Rasam recipe which I shared recently is a unique recipe. Mysore rasam is something similar to Tamil Bharmin Rasam only the coconut flavor is rocking. Mysore Rasam is South Indian Rasam very Famous in Mysoru/Bangalore. Rasam is our family fav. Whenever I make boil dal to make sambar reserve little dal or the dal water to make rasam. Dal water makes the Mysore rasam very tasty and yummy. We can have it like a soup also. Takes like lentil soup. Rasam is good for digestion and we can have it at any time. If you want to make a Different rasam try this Mysore Rasam Recipe, am sure you love it. Pre-Preparation: Cook the Toor dal with enough water and mash and keep aside. Step: 1 Dry roast the Rasam Powder Ingredients, add jaggery and Powder it. Ground it to Fine Powder. Mysore Rasam Powder is ready. Step: 2 Add chopped tomatoes in a pan and add water, Let it boil for few mins. Once the tomatoes become soft mash it. Add Tamarind Extract, Cooked Toor dal and mix well. Step: 3 Add turmeric powder, Mysore Rasam Powder, and salt. Let it boil. Step: 4 Heat ghee in a pan, add the mustard seeds, dry red chili, and Hing let to splutter. Drop over the Mysore Rasam and switch off the stove. Garnish it with coriander leaves and serve it with steamed rice. Simply you can have it as a soup. Dry roast the Rasam Powder Ingredients, add jaggery and Powder it. Ground it to Fine Powder. Mysore Rasam Powder is ready. Add chopped tomatoes in a pan and add water, Let it boil for few mins. Once the tomatoes become soft mash it. Add Tamarind Extract, Cooked Toor dal and mix well. 1. adjust the spice accrding to your tastebuds. 2. don't let the rasam to boil more, once it foaming at the top swtich off the flame. Mysore recipes like Mysore Bonda Recipe, Mysore Pak Recipe.